It’s 2018 and the Within Temptation machine has started again. With the new song “Raise” which appeared online, new things are happening and they’re happening fast! But Within Temptation did not yet answer all our questions. In this item not the things we do know, but the things we do not know yet. One of the first things, is an old rumour. Started back in December 2017. The EP “Midnight Sky” appeared online on the music stream website Last.fm. The five-track EP appeared for the first time online 3 December 2017, counts five tracks and currently has over 145k plays. But is this EP a true EP? We have never received an answer from the band or its members and this gives us certain question marks. The future will learn. 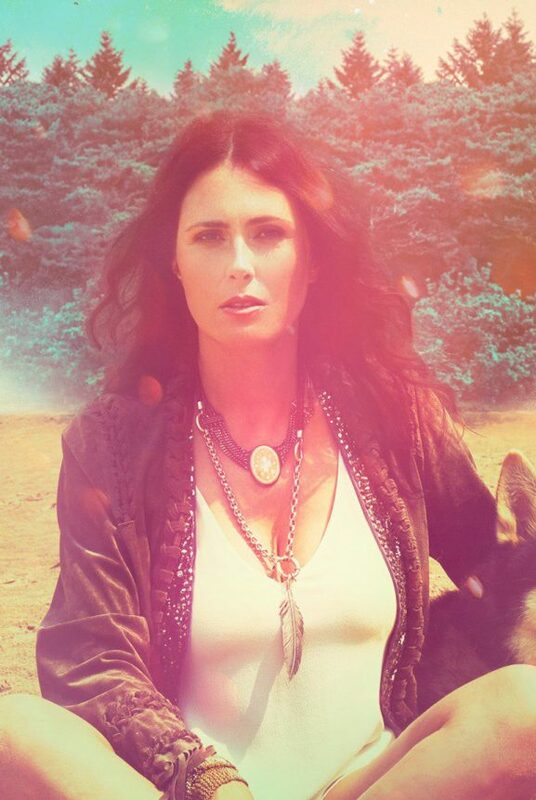 All we know for now is the track “Indigo” is probably not a Within Temptation track, or… will they surprise us? Back in the days, before we knew about Sharon den Adel her solo project “My Indigo”, her opportunity to get out of the limelight and come to terms with hardships in her personal life, and take a break from the strain of touring the world as the singer of the internationally successful rock band, we wrote you about three unknown tracks. The three tracks were published on the online music repertoire database of Broadcast Music, Inc., a online database where all music which an artist, singer/songwriter and/or compositor will be registered in the country of production. We were able to locate three unknown tracks, written by Sharon den Adel and other known names. Two of the three registered tracks are published under the label of Within Temptation, BMG Talpa Music Netherlands. 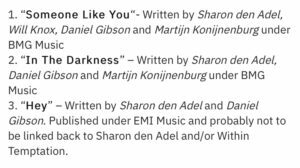 In the meanwhile, we learned “Someone Like You” was released as a track for Sharon her solo project “My Indigo”, and “In The Darkness” was later released as “Out of the Darkness” on her “My Indigo” as well. Which leaves us to “Hey”. “Hey” is a track written by Sharon den Adel and long-time producer Daniel Gibson. The track is published under EMI Music. 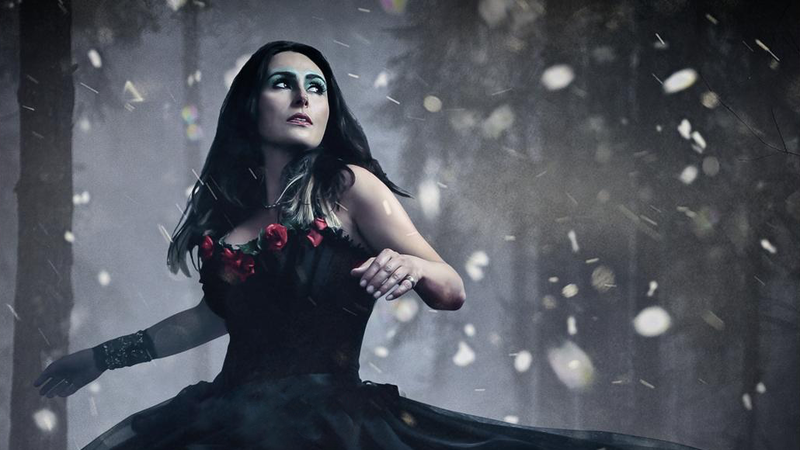 Back in the days, we believed this track has no direct link to Sharon den Adel and/or Within Temptation, however… Recently, Within Temptation signed themselves to a new label, Vertigo Music. Both Vertigo Music and EMI Music are part of the Universal Music Group (UMG) and makes us wonder, is “Hey” a new track we will know about more, soon? The future will learn. Now it’s time to talk about #WT7. 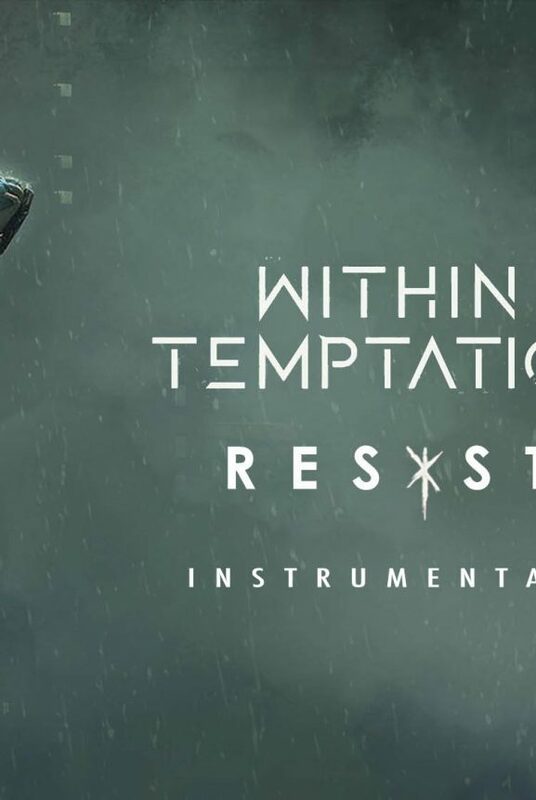 The seventh studio album of Within Temptation is coming somewhere early/mid 2019, that’s what we know now. Looking at the past, we’d expect an album release around March or April of 2019, if all goes well. However, next to 2019, the band has not even confirmed or communicated a single thing about their upcoming full length studio album. They’re practically leaving us in the dark. Where other artists will tease about every bit, with Facebook posts or Instagram stories, Within Temptation is on full silent mode. Which makes us wonder; why? We have now learned about their supposedly upcoming track “Raise”, on which we will talk about later on, but will this new album also be pre-released with an EP, like we’ve seen with their 2014-release “Hydra”? Will there be new collaborations? Will we see a ‘Sharja’ Pt. 2 on the seventh studio album? 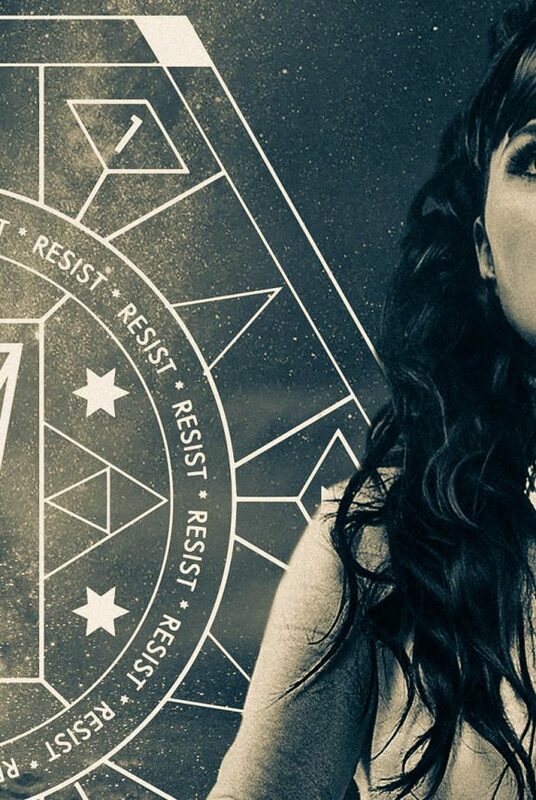 Fans have been begging for some kind of confirmation from Within Temptation, all they got was silence. We are excited and curious about what the future will bring. ‘Sharja’ is the collaboration nickname ex-Nightwish singer Tarja’s fans gave the two singers, back in 2013. Later also well-known with Within Temptation fans. In case you’ve been living in Bikini Bottom, or you simply haven’t been around much, last Friday a song “Raise” with (most likely to be) Anders Fridén from In Flames was released onto the big World Wide Web. Probably not the band its intention, but one of the band members (accidentally?) published the track on Apple Music Connect. 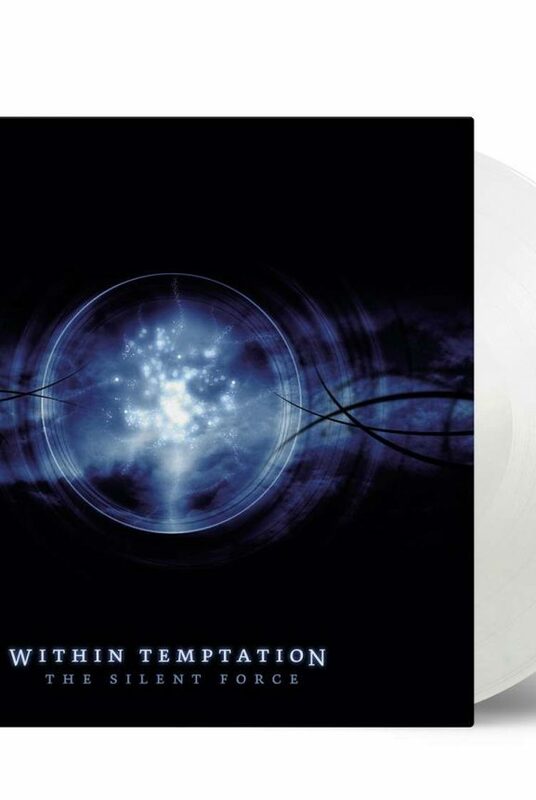 Wrong privacy settings or not, after we’ve published our item online, the Within Temptation fan base were talking about this track and only this track. Why this track? Was it supposed to be published to receive a sort of ‘publicity boost’? The future will learn. To us, this song sounds more like a not-mastered demo which will never see daylight in its current way. But will this be a preview of Within Temptations seventh era? Back to the roots of heavy(er) music? So many questions, and again no answers. We hope to know more soon, and yes – as soon as we know, we will update y’all. Last, but most certainly not least, the upcoming European tour “MMXVIII”. This tour was announced as a “We’ve been away for way too long, so here we are again!”-tour, but fans were expecting an album tour, which brand new songs. Will this be a tour filled with new tracks? The band has not yet responded to this frequently asked question of fans, so we will. The answer is, most likely not. Why not? The 2018-tour of Within Temptation hits the road on Thursday 11 October 2018, which gives the band – at time of writing this item – two months to release plenty of new music. To promote their new music, release some music videos, make appearances in media (radio, TV, interviews). In our beliefs, this is not a reasonable time span. However, a couple of new tracks might be performed for the first time live, during their “MMXVIII”-tour, to warm up the fans for their upcoming seventh full length studio album. Want to watch Within Temptation perform live, in 2018? Act quick. Several shows are sold out or close to sell out. Purchase your tickets while you can. It’s official, the wait for the seventh full length studio album, the follow-up on their 2014-release “Hydra”, is a fact! How excited are you for this release? Let us know your thoughts on Twitter or Facebook.